I’ve seen pictures of beautiful farmer’s markets around the internet. Or, at least ONE beautiful farmer’s market. And, at least, it seemed to LOOK beautiful in the pictures. Which is one of my points with this blog post — pictures glorify reality. I remember the first time I went to my local market. My friend, Adrianne, told me about it and invited me to go with her. I had visions of beautiful flower vendors and rows of tables with stunning baskets of perfectly arranged produce. I’ve seen pictures online. That’s what a “good” farmer’s market looks like. Right? 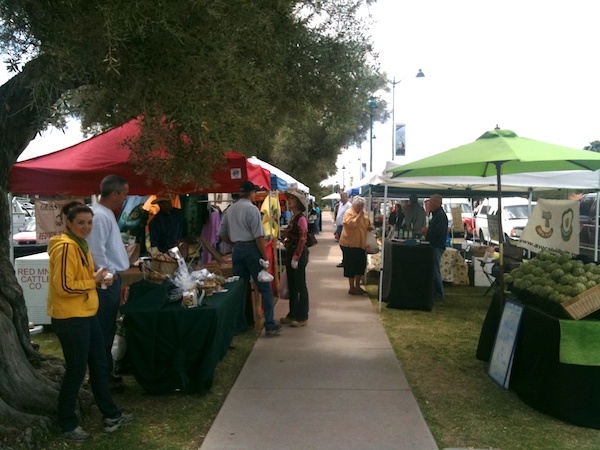 A good farmer’s market is an existing farmer’s market. But guess what? It has fresh local produce! And believe me, fresh local non-genetically altered produce is pure awesomeness. So, if you have fresh locally grown produce at your market, and nothing else, then you have a good farmer’s market. I got over the fact that our produce vendor is under an ugly green tent that discolors photos in an ugly way. I don’t fret that our produce sits in banged up florescent yellow bins instead of gorgeously displayed baskets — which I now realize look better in pictures than in reality. On the other hand, I do enjoy the chit-chat and joking we do with the farm family we’ve gotten to know over the past year. I definitely enjoy the fresh local foods. I like being a part of my community. If you’re waiting around for “good” to come — any kind of good — you’re probably just missing it. Because of the internet, we see great-looking pictures of other people’s lives where the ugly and the clutter is missing, and we compare that to the unedited view of our own environment. Ugly is everywhere. Mundane is everywhere. But beauty is everywhere, too. Beauty that is unique to an area’s personality, that isn’t the manufactured big-box beauty we’ve learned to expect, only shows herself to those who look for her. I don’t have a “good” farmer’s market. Except that I do. Because any farmer’s market — by its very nature — is good, even if it’s not the gorgeous one we’ve seen in pictures. If you think your city or town doesn’t have a good market, please rethink that. Go visit your market. Is there naturally grown produce? You’re so lucky — you have a good farmer’s market! For once I can say we have a great Farmers Market. I live in the middle of Amish Country and the local produce is wonderful! We also have baked goods, cheeses and some home crafted items. I’m just sorry to see the cold weather come and and the market leave until next Spring. Oh thank you for this post! We are living in a time when it is so easy to think the grass is greener somewhere else. We are convinced of it by the seeing color enhanced images through photoshopped eyes. Our local farmer’s market started out a couple years ago really tiny. This year it was quite large. Have I gone to it? No…but it’s every Saturday in the summer and I drive by it many times. The biggest reason I don’t go, is that I don’t usually buy resh produce before Sunday. And that’s because…I don’t know what the heck I’m doing wrong…but I have a horrible time getting most of it to last more than 3 days. Tomatoes and onions are the only things I can keep longer. So alot of times I buy my produce on the day I want to prepare it. I just pick it up on my way home from work. My grocery store does advertise certain items that they’ve bought from specific farms in the area. So I suppose that’s better than nothing. But I do think it’s very cool that our farmer’s market has gotten bigger with each passing year. They practically fill half of the square in the center of town, when they used to barely fill 1/4 of it. And there are usually crowds when I drive by. i truly love our farmers’ market. it’s on every sunday in our little neighbourhood of london and we walk there most weekends to pick up vegetables, eggs, hand-churned butter and a few other things. i almost always get a brownie from a place called flour power that seriously makes my mind boggle with how amazing they can bake. the boy almost always gets a sausage sandwich that although i have no interest in eating i will certainly say it smells yum (and i usually don’t like the smell of that sort of thing at all). so the market is part of our routine. 🙂 but the best part is that it is part of so many people’s routines here that you can catch the pulse of the whole village. you don’t even need to speak to anyone – just listen while you walk from stand to stand and you’ll hear all the news about the area. when decisions are made that don’t help the village, it’s where people gather support – like how our local government wants to close our tiny village library or how the olympic committee is planning to close our nearest park to the public for six whole months to prepare it for the games. our market is held in the car park of the train station and it needs some maintenance work, so the owners of the car park assumed they could just not have the market for one or two weeks. even though it would be in colder weather, everyone who shops there was gobsmacked at the idea, so now they are going to go ahead with some reorganisation and repair half one week and half the other so the market can just move into the space that’s available. all that because everyone wants to say hello and buy vegetables every sunday lunch time. i totally, totally love it. Shimelle -That sounds so neat. I want to visit! Noelle – I’m pretty sure it’s normal that most vegetables don’t last longer than three days. That’s how long most of mine last. I usually make a stop somewhere else mid-week for more fresh veggies to hold us over until the next market day. That is really nice that your local grocery store sells local stuff and advertises it! I’m not aware of ANY of mine selling local produce, but I’ll have to start asking, for sure! Michele – Totally. 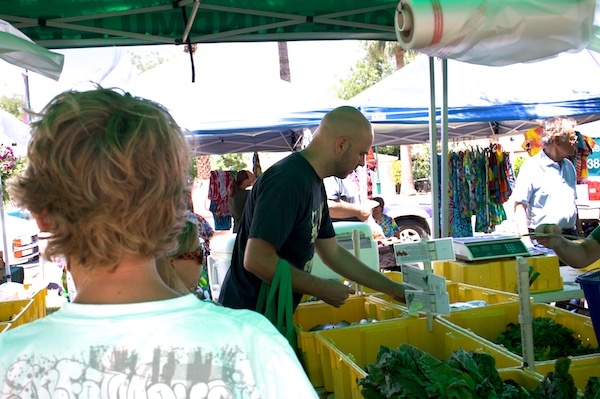 It’s not just with farmer’s markets, but everything! Laura – that sounds so nice! I have been one to tell you that you are very lucky to have great farmer’s markets. Where I live, they are trying to get one established. I have to say that this year, it has been way better and more fun than in the past years. I do have to say, that I have been to a fabulous farmer’s market in Omaha, NE and I had the most fun! Karen – I think there is an upsurge in people looking to buy local. A year ago, our market only had 1 vendor. That’s about when I started going. I read that it now has 30 (it doesn’t look to me like they’re all 30 there at the same time, though. ??)! It’s been going since 1995, so to go from 5 last year to 30 this year is an amazing turn! The more people there are, the more vendors will want to set up shop there. We share our finds with our friends in hopes they’ll start going too. Most everyone I talk to has no idea our city has one.